ChordCommander, Educative Software from Dog Ear Software. Dog Ear Software gets into educational software with ChordCommander, designed for guitarists who want to learn chord progressions. ChordCommander is mainly designed for 6-string guitar players but presets are available for 4, 5 or 6-string bass and ukulele. 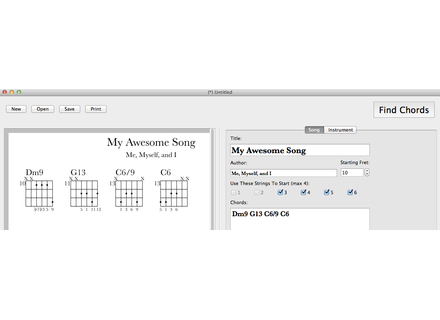 Available on Mac OS X and Windows, the software automatically generates chord progressions from a chord entered by the user. Diagrams generated include fret position and even note intervals. The software recognizes any type of chords, jazz included, 9th, 13th, diminished, altered, etc. and you can customize the number of strings and the tuning of each string, so shredders and open tuning players can use the software too. Also, ChordCommander is designed for left-handed players with special presets included. Dog Ear Software is currently looking for beta testers for ChordCommander, you can register now at www.dogearsoftware.com. Plugin Alliance X-Mas Calendar launched You can now open the first Plugin Alliance X-Mas Calendar door and discover the special deal.